It takes the efforts of many to keep the RWMA going. Volunteers and fundraising are vital to its success. 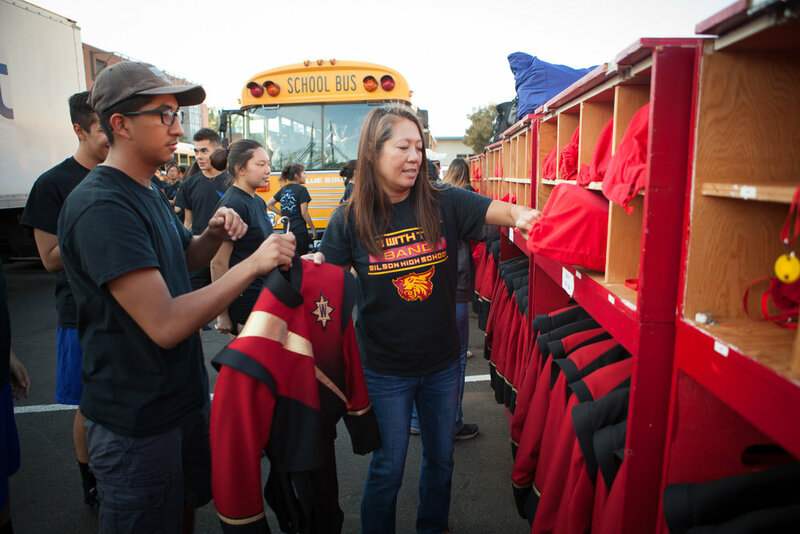 Equipment needs to be transported, uniforms need to be cared for, students need to be fed and hydrated during competitions, and chaperones are needed to accompany the students on the buses. We are always in need of parent volunteers to help with the duties necessary in keeping the RWMA afloat. Our busiest time of the year is marching season, when we have our flagship fundraiser the Golden State Field Classic. Here are some of the areas the WIM Club is looking for volunteers. “Pit Crew”: This group takes its name from the location of the orchestra, usually below the stage, out of sight as in the pit. In our case, it consists of loading the trailer with drums, bells, chimes, etc. and deploying these instruments on the front part of the field moments before the performance. The Pit Crew also does the same thing at home football games. An added feature, the pit crew is able to watch the performance up close and personal on the field! Chaperones: People are needed to ride the buses and to sit with the kids after they have performed at the competitions. This keeps you young at heart! All volunteers who will be working with the students MUST submit a volunteer application and be cleared through the district. Construction: This can mean anything from building cabinets in the uniform room to building props needed in the field show, or repairing instrument stands. One year, we had to build eight large fans spanning 10 feet and cathedral stained glass windows 20 feet tall as props for the field show. Anyone handy in design, carpentry, welding, or general construction are needed. See any Board Member for this task. Drivers: The WIM Club usually drives a 26 ft. rental truck and a utility trailer which contain the uniform boxes, large instruments, props, and anything else needed for competitions. We can always use people with a trailer hitch capable of pulling a 14 ft. trailer or willing to drive the truck. Also, as part of the “pit crew” deployment operation, we can always use drivers willing to operate our ATV, which hauls our trailer onto the competition field in preparation for the unloading and loading of percussion instruments. Food Preparation: If you are accustomed to serving large crowds quickly, and even if you are not, we need you! Usually we give the kids a small meal, such as hamburgers or sandwiches between morning practice and leaving for the competition on Saturdays, depending upon the performance schedule. We also usually provide them a snack after they perform at the competition. Fundraising People: This is a tough one because it means all of us and none of us! If you work for a major company, that company may have a matching gift program that recognizes schools or any Non- Profit charitable organization. The WIM Club, Inc. is registered with the State of California as such. Therefore, it can be the recipient of a matching employer gift or donation. If you have a knack for calling on businesses for donations, please talk with the Vice President – Ways & Means for details on how you can help! Another area is grant writing. Anyone familiar with this process please come forward and see the Band Director or the President of the WIM Club. Publicity: The WIM Club publishes news on recent events as well as plans for the coming weeks on their website and by e-Mail. Anyone familiar with web publishing software programs, graphics, or photography is always needed. The articles are written by others, all you need to do is post them to the website and e-Mail list! Concessions: We have a concession booth at the football games. We need volunteers to help set up, sell concessions and clean up after the games. See any board member for this task. Uniforms: We need people to prepare the uniforms at the beginning of the season during Band Camp by measuring and sewing/hemming the uniforms. Also, any time the RWMA is performing in uniform, we need people to distribute the uniforms. We always need people at “call time” before home football games and field show competitions. The RWMA has many moving parts that require many volunteers to help with. If you've never volunteered and didn't know quite what was expected, here are some answers to Frequently Asked Questions. Do I have to be a volunteer to attend a band event? No, parents are invited and encouraged to attend football games, concerts and performances throughout the year. If the event is out of town and you want to meet the band there, refer to the website news for location and time info. Do I have to have a background check to volunteer? You do not need a background check for most home events unless you are requested to chaperone or watch over students. If you have requested to chaperone the students on the bus to and/or from events and performances, you need to register as a volunteer with the school. This does involve a fingerprinting and background check. Parents are requested to pay the fees for the background check. I think my child would rather not have me around them at school. Remember that when you volunteer, you are not there to hang out with your child. With all that the RWMA needs help with during events and performances, you most likely won’t have time to see your child. Give them the freedom to join you or stay with their band friends and ignore you. Once they realize you can be there and not intrude, they will trust you to be in the background. Although we do not charge parents to volunteer, each event varies and parents are asked to pay for their own expenses such as meals on the trip and in some cases, tickets for admission (depending on how many tickets they give us). There are some events where volunteers are requested to wear a shirt identifying their affiliation with the RWMA, so there may be a cost for a t-shirt or polo shirt. We ask parents to pay for the cost of these shirts and they are theirs to keep (but we will do our best to accommodate those who can’t afford it). We try to keep all expenses to a minimum but as WIM Club volunteers, we do not use funds raised by students to pay for the volunteers costs. Oh the joy! The priceless moments you will have seeing your child perform. The chance to see such an amazing group of students working as a team both in getting ready, performing and standing together in both days of victory and days were they walk away with less than expected. The RWMA is not just a band, it’s a family.